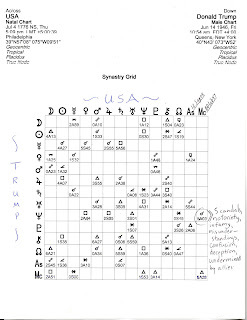 A synastry grid comparing the natal planets of Donald Trump with America's natal planets is replete with potentials for tension, anger, scandals, notoriety, confusion, misunderstandings, deception, and undermining by and of allies--but also an attraction, plus the possibility of Chirotic healing, or at least a soothing, of our society's past hurts which I suspect refers primarily to his constant opening of America's oldest wound and flaw, racism, and to how his rhetoric and policies continue the class divide that began in ye olde Jamestown Colony centuries ago. Instead he chooses to stir up trouble on these issues, capitalizes on them, and shoves an even wider wedge between us in any way he can. For everyone knows that 'divide and conquer' tactics always work against the American people. And as you know, his nibs is an anything-to-gain-power demagogue full of emotional turmoil and suffers with a bottomless pit of ego needs that can never be fully satisfied. We can see Trump's natal Moon-South-Node conjunction as basic evidence of his extreme emotional deprivation via estrangement from Mother, an estrangement the adult Donald can't seem to recover from and I suppose most of us never could whose Mother went missing in some way. 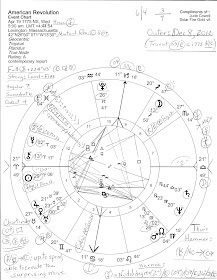 So in this post I shall attempt to provide brief notes on some of the main aspects between Trump's and our national planets but without US natal ASC and MC - except for two as-ifs because they seem to apply - 'DT Neptune conjoins US natal MC' (00Lib47) and 'DT Pluto trines US ASC' - since a variety of timings are used for the US natal chart (July 4, 1776) which gives differing chart angles. Here I'm using a 5:09 pm LMT US chart with 12Sag08 rising but US planets remain in basically the same positions no matter which hour is used on that date with the natal Moon remaining in Aquarius. 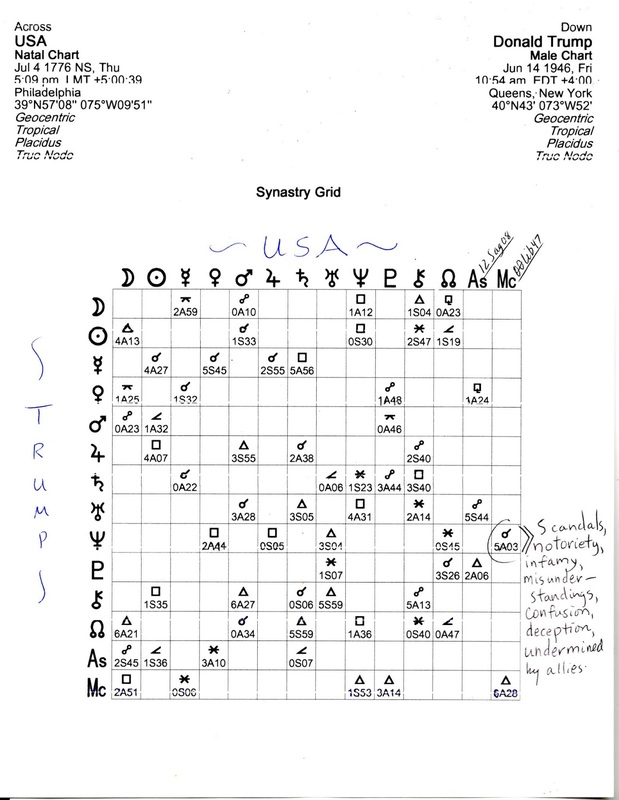 DT Moon inconjuncts US Mercury: emotional Trump vs US rationality causes friction. DT Moon opposes US Mars: anger issues; 'time bomb' set to explode; stirred up emotions; actions and reactions motivated by emotions; emotional connection to the military. DT Mars opposes US Moon emotions boil over; rash actions; hostility; feeling under siege; angry women. DT Moon squares US Neptune: living in a fog; emotional upsets; domestic troubles; taking everything personally; retreating to familiar territory (see golf pic, below); grief or loss. DT Moon trines US Chiron: capitalizing on our hidden or deepest emotional needs; consciousness of our national wounds; opportunities for healing. DT Moon sesqui-squares US North Node (the public): strong emotions litter a hard-to-travel journey. DT Sun trines US Moon (We The People): enthusiastic feelings; pride and optimism. DT Sun conjoins US Mars: taking risks; impulsive actions; exciting--never a dull moment. DT Sun squares US Neptune: confrontations with reality; efforts to deliberately mislead; overwhelming problems; confusion; treading water to stay afloat. DT Sun sextiles US Chiron: consciousness of the potential for transformation. DT Chiron squares US Sun: issues of socio-cultural authority. DT Sun semi-squares US North Node: a fated yet challenging attraction; a destined relationship. DT Mercury conjuncts US Sun: consciousness of personal intent. DT Mercury conjuncts US Venus: discussing goals, joint ventures, relationships, legal matters; giving advice. 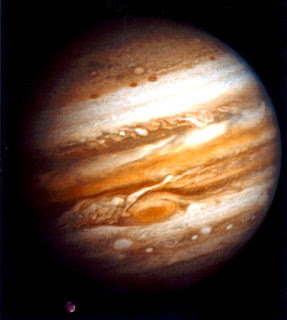 DT Mercury conjuncts US Jupiter: communicating about political activities, publishing, cultural pursuits; expansion of advertising, propaganda, current news, plans; international communications. DT Mercury squares US Saturn: application of plans, methods, or ideas delayed, limited, or blocked; plans must be re-done. DT Neptune conjuncts US MC: professions may be related to the occult (such as Masonry and the Masonic hand signals he constantly tosses out during his on-camera rhetoric); unreliability; scandals, secret intrigues, and public disgrace. 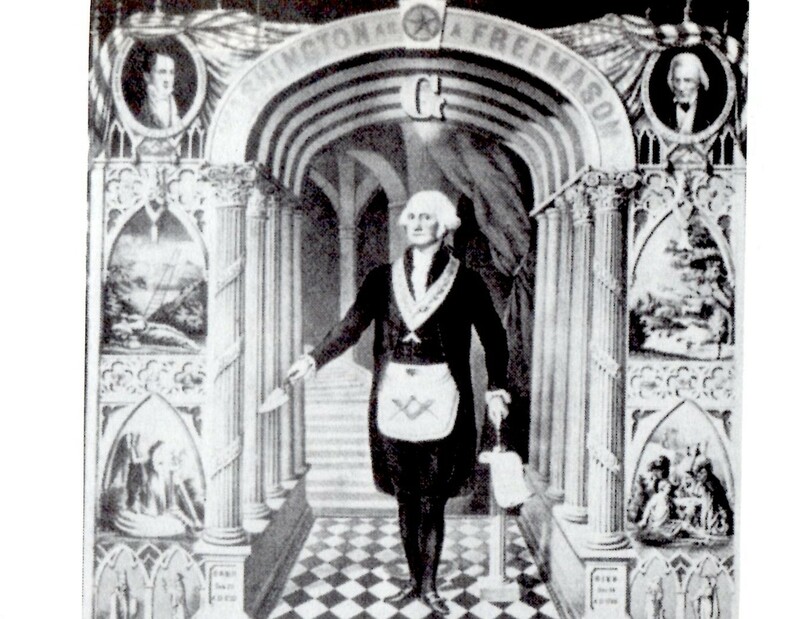 DT Pluto trines US ASC: a driving ambition toward leadership; understanding power and how to deal with or use those in power; home or profession as a base for occult endeavors; favors those who work in Politics. (More info: The Astrologer's Handbook, Sakoian and Acker; Synastry Grid compliments of Solar Fire Software Gold v9).